Remember that Giant Gundam that was displayed last year in Shiokaze Park in Odaiba Tokyo? You know, that 1/1 scale , 18 metre, 35 tonne, mist farting behemoth that was visited by over 4 million people praying that it would come to life and defend Tokyo from future attack by Godzilla? It’s Back, and this time it will be armed! The Gundam was originally displayed 30th anniversary of the broadcast of the first Gundam anime series from April 1979 to January 1980. The Gundam will now be displayed in Shizuoka at the east exit of Japan Rail Higashi-Shizuoka Station. Shizuoka is the capital city of Shizuoka Prefecture, Japan and is located to the south west of Tokyo, it is also the city where Gundam plastic models or ‘Gunpla’ are made which are popular with Gundam fans in Japan and worldwide. I myself own a small collection of gunpla I a proud of. 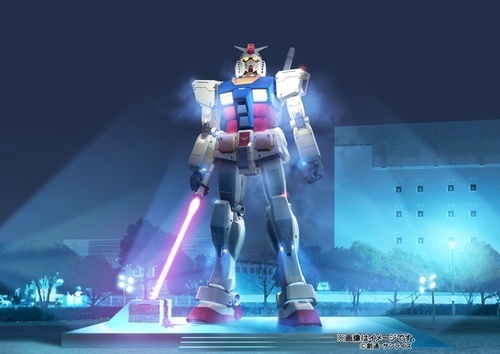 City officials hope to hosting of the giant Gundam statue will boost the economy of the city with 600,000 persons expected to visit the statue at it’s new location now complete with a beam saber! I think Sendai should do something like this to draw people in. Maybe they could put up a giant statue of Date Masamune. ohhh yea! I missed it the first time .. soooo wanna see this!